Last Monday, the Inprint Margarett Root Brown Reading Series welcomed poets Ada Limón and Gregory Pardlo. The poets, former classmates at NYU, have both recently been recognized: Limón’s Bright Dead Things was a finalist for the 2015 National Book Award and National Book Critics Circle Award. Pardlo won the 2015 Pulitzer Prize for his collection Digest, and as of Thursday, a Guggenheim Fellowship. Poet Kevin Prufer, who also serves as a professor at the University of Houston’s Creative Writing Program, moderated a discussion with both after the reading. This year, the Association of Writers & Writing Programs held its annual conference (AWP) in Washington, D.C. More than 12,000 writers and publishers flooded the city for four days of craft talks, panel presentations, readings, and more. Houston writers represented the best of our city’s expansive literary community. In fact, Houston was so well-represented at AWP it would be impossible to list every event. Instead, I’ll highlight just a few. Houston’s literary community is brimming with activity. One of the key players making Houston such a vibrant literary city is the UH Creative Writing Program, nationally ranked as one of the best creative writing programs in the nation. Inprint is proud to continue providing fellowship, prizes, and other support for emerging writers in the Program, surpassing a total of $2.8 million to date. Giuseppe Taurino, Assistant Director of the Program, will now blog on An Open Book to share exciting news from UH. His inaugural post extols the virtues of 15 notable books written by faculty, alums, and students from the Program, many of whom have received Inprint fellowships and prizes. I grew up in a working class immigrant family. My parents, along with most of my mother’s family, came to New York City from Italy in the early 1970s. None of them finished grade school. The moment I made it to October of my first semester at NYU, I’d gone further in school than anyone on either side of my family had ever gone. And when I actually earned my bachelor’s degree, I became proof that everything my parents endured over the course of their journey had been worth it. Even my father’s father, who was rarely impressed by anything, believed I’d taken the family to new heights. He was convinced my BA in Psychology made me a doctor—the first in the family—and went so far as to ask me to review and assess the medical reports detailing his heart and blood pressure conditions. As most of us in the literary world know, April is National Poetry Month. It is that cheery time of year when we pay tribute to the world of poetry and the people who write great poems. Poets do not traditionally receive the level of book sales, media coverage, and public popularity that other writers do, so I would say they truly deserve a month dedicated to celebrating their unique brilliance. Houston is brimming with poetry activity all month long and if you venture out every once in a while, you will find it difficult not to stumble upon a poetic activity or two. For Inprint, the superstar Anne Carson will be closing out the 2013/14 Inprint Margarett Root Brown Reading Series on April 28th. Michael Ondaatje says Anne Carson is “the most exciting poet writing today.” Houstonians are definitely excited about her reading, with less than a hundred tickets left, Carson is evoking fan girl enthusiasms from poetry lovers. We plan on giving her fans exactly what they want. Unlike other Inprint readings, Carson will be taking the stage by herself, reading and perhaps talking about her poems. She will forgo an on-stage interview. For more information click here. On a more local level, Inprint was proud to have the Inprint Poetry Buskers out and about last weekend at UH Mitchell Center’s CounterCurrent Festival. If you haven’t experienced the Inprint Poetry Buskers yet, stay tuned, you’ll be seeing them more and more. 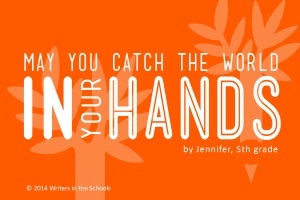 They write poems on demand for free using typwriters for anyone who stops by to visit them at festivals and other events. For those who feel that poetry isn’t for them, wait until someone writes you your very own poem! Catch them next at the Menil Community Arts Festival May 3rd . Every once in a while you are lucky enough to find a book that is not only a great story, but a book that rocks your world. It changes the way you think, expands your world view, and makes you question what you have previously assumed. We hear Kevin Prufer is one of those lucky people; he can’t stop talking about The Swerve: How the World Became Modern by Stephen Greenblatt, winner of the National Book Award for nonfiction. We asked Kevin to share his find with us. Inprint: The ideas in The Swerve are complex, fascinating, and timely. Can you briefly break them down for a lay person? 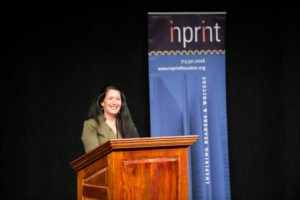 Inprint is a nationally recognized nonprofit literary arts organization connecting and nurturing readers and writers in Houston, Texas. Dispatch 15: Chris Cander and The Weight of a Piano go to LA!